Rent a Mechanical Bull for your western theme party in MD DC VA or PA - Yeeehawwwww! The deluxe mechanical rodeo bull is a real Wild West adventure! 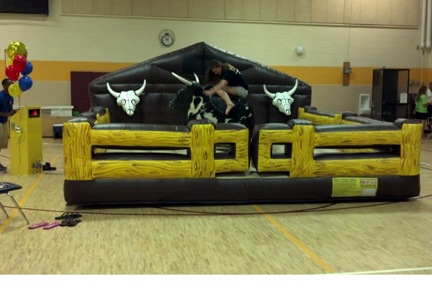 See how long you can stay on the bucking bull. Mechanical Bull - Yeeehawwwww! The deluxe mechanical rodeo bull is a real Wild West adventure! Test your skills as a cowboy and fight to stay on the bull as long as you can. The authentic looking bull and western-themed inflatable corral will be a great addition to any western theme party. Our operators can manually set 10 different speeds - creating fun for all skill levels. Includes: inflatable mattress, 1 blower, mechanical bull, control panel, 2 digital timer displays, and 1 attendant.